The ASRock Z390 Phantom Gaming 6 sits below the Phantom Gaming 9 and Taichi boards in the product stack and offers similar features and design aspects, but at a lower price point. The Phantom Gaming 6 remains ATX and has the same RGB capabilities as the Phantom Gaming 9 and users would be hard pressed to tell which is which if they didn't already know; the chipset heatsinks are a slightly different shape, the power and reset buttons are this time located at the top and the Gaming 6 has an extra PCIe 3.0 x1 slot. Speaking more of PCIe, the Gaming 6 has three full-length PCIe 3.0 slots all coated in ASRock Steel Slot reinforcement and the slots operate at x16, x8 and x4 respectively. In regards to storage, the Z390 Phantom Gaming 6 has a total of eight SATA ports and has two M.2 slots which both allow for PCIe 3.0 x4 and SATA based drives to be installed. The board also has four RAM slots with support for up to DDR4-4266 and the capacity for up to a maximum capacity of up to 64 GB Unlike the Phantom Gaming 9 which has eight fan headers, the Phantom Gaming 6 has a reduced number with a total of five 4-pin headers available. Along the bottom of the board is an LED debug and ASRock advertises the board as having a 12-phase power delivery with an 8-pin and 4-pin 12 V ATX CPU set of power inputs which is mirrored from the Gaming 9; the board looks to be the same PCB, but with different componentry. 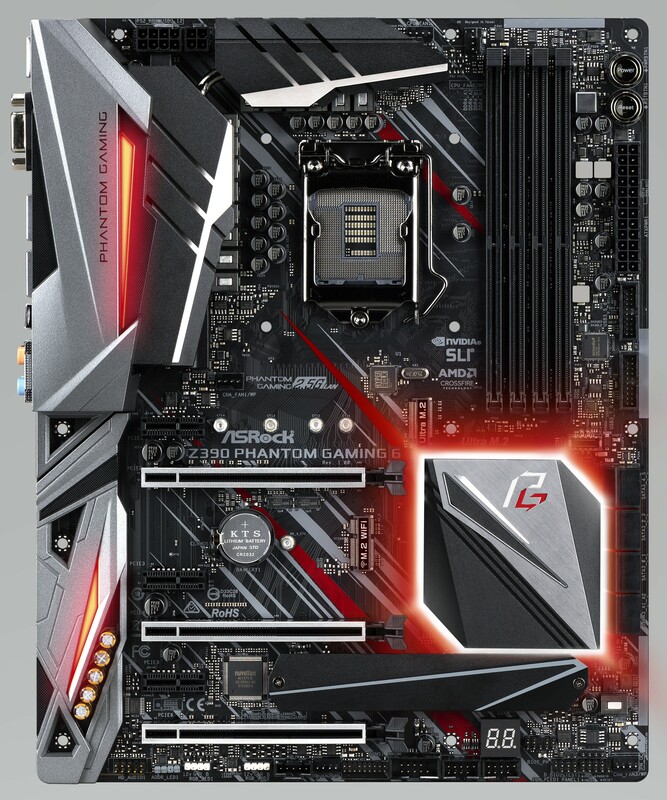 For the Z390 Phantom Gaming 6, ASRock has dropped one of the three LAN ports (Phantom Gaming 9) and equipped this board with two which consist of an Intel I211AT Gigabit and better grade Realtek RTL8125AG 2.5G LAN. The Phantom Gaming 6 also drops Wi-Fi support and some of the rear panel USB 3.1 Gen2 ports with a total of two composed of a Type-A and Type-C port; rounding off the USB is three USB 3.0 Type-A ports. A Realtek ALC1220 HD audio codec is included which offers five 3.5mm audio jacks and a single S/PDIF optical output and a trio of video outputs comprised of an HDMI, D-sub and DisplayPort. The ASRock Z390 Phantom 6 has a recommended retail price of $200 which sets this as one of the most feature-rich in its price point, especially with dual LAN including a 2.5G port. The board does lack Wi-Fi connectivity but for users looking to drop some features and ultimately the price, but keeping much of the same componentry and quality features as the $270 Z390 Phantom Gaming 9, the $70 price reduction seems fair.